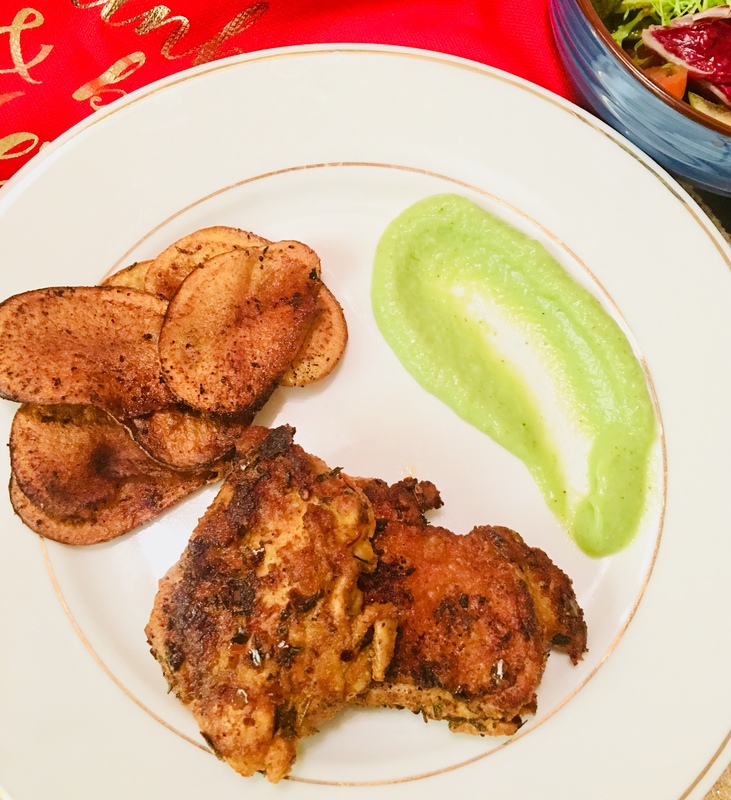 This chicken dish is so easy to prep, make and devour that whenever I’m not sure what to make for a quick dinner, this is my go-to dish. I got the inspiration for this recipe on NomNomPaleo.com, put my own spin to it and have been hooked ever since. I always get my meat from the local butcher store or halal market only because their meat is so fresh, they absorb flavors of seasonings like a sponge. I bought supermarket chicken just once in America and I couldn’t stomach it, nor are they nutritious. Seriously folks, just try buying your meat from local butcher and you’ll never go back to a frozen-and-thawed meat at the supermarket again. The dry rub I have made here is THE BOMB guys. Though you can feel free to use any seasoning of your choice, I would recommend you try my dry rub once. You will thank me later. I make big batches of this rub and save them in an air-tight container to use in all kinds of dishes like fish, chicken, eggs, steak and more. Also, I’m in love with my cast iron skillet and I use it for almost everything in my kitchen. Its something about cast iron that adds an amazing flavor to the dishes. Veggies or meat, everything goes in my cast iron skillet. I’m proud to say, I’m an addict! Pour all of the ingredients for dry rub in a bowl and mix up to combine. Keep aside. Your dry rub is ready to use. Alternately, feel free to use your choice of seasoning. Pat chicken down with paper towel until dry. Using a meat pounder, flatten the chicken to ensure uniform thickness. Season the chicken generously using the dry rub on all sides. Marinate for a couple of hours in the refrigerator if time permits. If its high quality chicken from a butcher store, you won't even need any marination. Heat ghee on medium heat in a skillet. Place chicken thighs on the skillet skin side down. Let the skin fry until crisp and golden, about 7-10 minutes. Flip the chicken and cook until cooked through, about 5 more minutes.